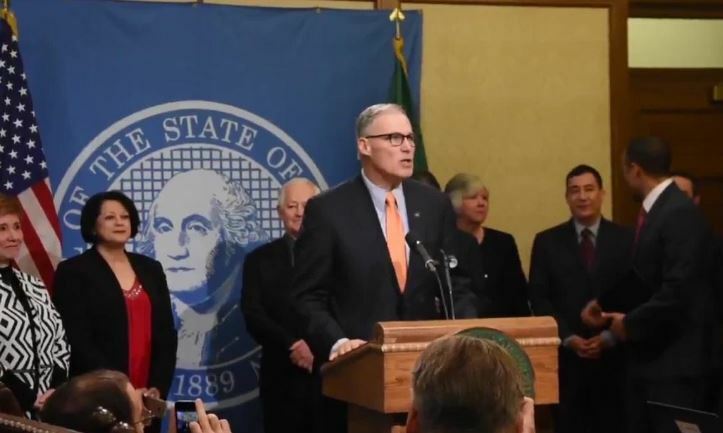 The governor of the State of Washington has actually declared war on the United States as a federal government signing an executive order to prevent any state employee to assist the Federal government in deporting any illegal aliens. This is demonstrating the trend toward the breakup of the United States. No State governor has the authority to refuse to comply with the Federal Government for the State of Washington is bound by the Supremacy Clause of the United States Constitution (Article VI, Clause 2) establishes that the Constitution, federal laws made pursuant to it, and treaties made under its authority, constitute the supreme law of the land. Ironically, here we have the governor of Washington committing a serious offense exactly as the South did in refusing to desegregate. The way the Federal government broke the South in the ’60s, was using this clause. There it was the South refusing to end segregation and here we have cities and states committing the very same crime by claiming they are “safe” areas to protect illegal aliens. History is repeating – the issue slightly changes. The Fed would be legally justified to now cut off all federal funds to the State of Washington. It is interesting that those who aspire to the left are willing to subjugate the rights of anyone who disagrees with them, but they refuse to comply with the law when it goes against what they want to do.